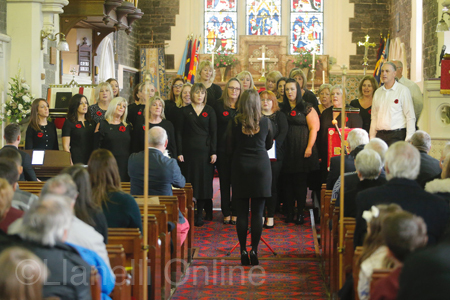 Hundreds of people in the village of Dafen, near Llanelli, turned out for a special remembrance service to honour their fallen soldiers in World War One. Members of today’s armed forces and emergency services joined the local congregation at St Michael and All Angels’ Church alongside council members and visiting dignitaries. Buglers sounded the last post; hymns were sung and the Welsh and British National Anthems. The service was the climax of a year-long project to make Dafen a place fit for its heroes from a century ago. In all, seventeen men from Dafen lost their lives in the conflict. A memorial garden has been created, also two memorial benches and a book naming all those who died. And it was to the garden that standard bearers led the congregation from the church for an act of remembrance at which the names were read out and wreaths laid in their honour, to accompaniment by the Royal British Legion Llanelli Band. There were also readings and prayers by local clergy including the vicar of Dafen, Revd Sulin Milne.